Eighting/Raizing, distributed by Capcom USA, Arcade, 2000. How can you tell a developer is running out of ideas? They start remaking their old stuff. Not that that's a bad thing. 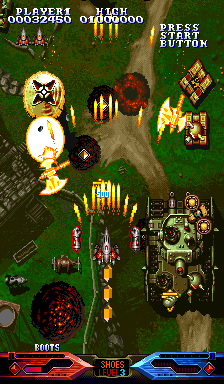 Way back in the day Raizing made a fun little shmup called "Mahou Daisakusen," or "Sorcer Striker" to the english speaking world. Seven years later, a remake comes along, under a completely different title, and it plays more like Batrider than its predecessor. This game does have something resembling a plot (gasp). Apparently the guy down my street who wears tinfoil so the aliens can’t read his mind was right about one thing; the Earth is hollow and inhabited by goblins who want to take over the surface world. At least that’s what the opening to “Dimahoo” says, along with “Are you great? We are great!” flashing across the screen with the intention of giving the player an epileptic fit. Being that Capcom collaborated on this, I was half expecting someone to yell “Triumph or Die!” at some point. Powering up your primary shot requires you to pick up coins. You need several coins to go up one level, which creates the added fun of scrambling for every coin the coin bag thing drops when you shoot it. 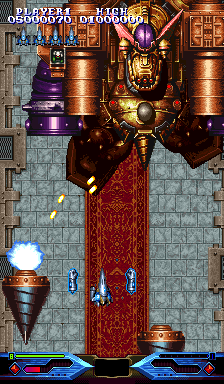 You also need several golden jewel crystal things to increase your bomb stock (similar to the bomb system in “Batrider). A bar at the bottom of the screen tells you how close you are to having another bomb. And crystals will follow your ship around as a means of informing you how many bombs you have left. You can also level up your magic (the equivalent of your “option” in other Raizing games). Magic has an interesting feature in this game. You can power it up for a really mighty charged attack, but by powering it up (hold down the fire button) you can also switch the type of magic you use between fire and ice. This is important since some of your enemies have elemental alignments, and will either take little or extra damage depending on the type of magic you’re using. This creates a fun element of having to switch your magic type to deal with magic enemies, such as pulling out your fire magic to deal with ice-based foes. On the other hand, the game has a bad habit of throwing both fire and ice enemies at you simultaneously, and since switching magic requires you to charge your shot, this becomes awkward, then frustrating, then downright hateful. Scoring in this game means going after special items (because bread, one such item, is all that special). You can get items by killing enemies with your charged shots, or killing them with regular shots while your charged shot, which lasts several seconds in most cases, is firing. 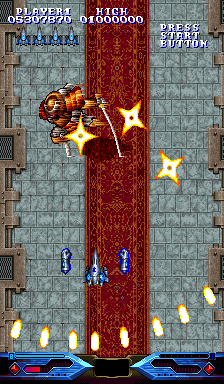 Enemies killed with the charged shot drop large and special items, while enemies killed with regular shots during the charged shot drop smaller, less spectacular items. 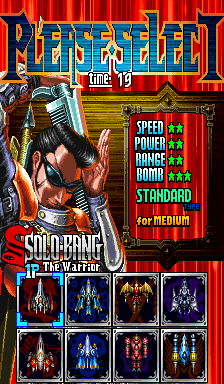 I haven’t noticed an actual effect on your score, but the game encourages the player to get every possible item, which is incentive to kill nearly everything with charged shots and collect all items great and small. As stated, I haven’t seen an actual effect on scoring, but I did feel rather good about myself when, in one game, I had gathered all the “food” items. It brightened up my whole day! 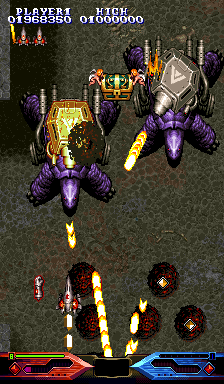 Much like “Batrider,” this game is challenging and fun, with lots of bullets everywhere. 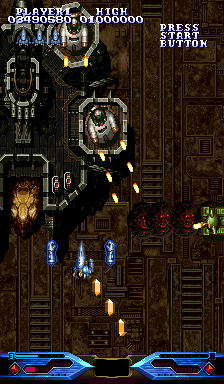 Your ship is relatively small and, depending on the ship, can be quite nimble, so evasion succeeds at being challenging without being frustrating. 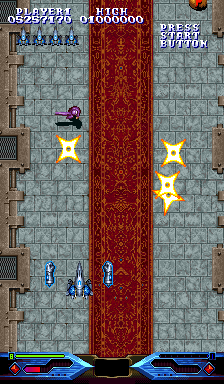 To make things a tad easier, enemies fire magic bullets that don’t kill you...initially. If your hit by a magic bullet of the same elemental alignment as you (red bullet and you’re using fire magic), then your magic power goes down. If it’s the opposite alignment, shot power goes down. While it’s nice that it doesn’t kill you, I personally find being weakened much more annoying. Just kill me already! 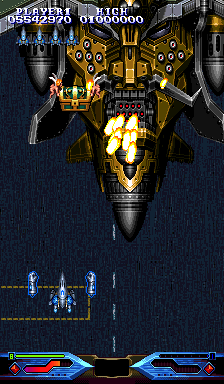 Visually, the game is a vast improvement over the original, with big, beautiful sprites and lots of fiery death. If you look closely, there are even little goblins in various weapons, and goblins running around on the ground. And when you kill them in the first level, the peasents they were terrorizing will wave to you! Yay! 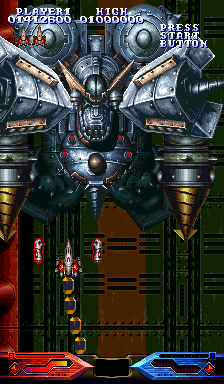 While some of the bosses are originals, many are beefed up versions of baddies from the original. And, much to my joy, they have lots of parts so you can kill them piece-meal if you like. I like to blow up all my enemies guns before I finish him off, maybe it’s in retaliation for leveling down my magic attacks. 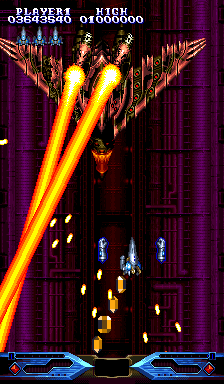 It’s fun, but probably not a good idea, since some of the bosses get meaner the more stuff you blast off of them. For your health’s sake, you might want to just kill them and get it over with. 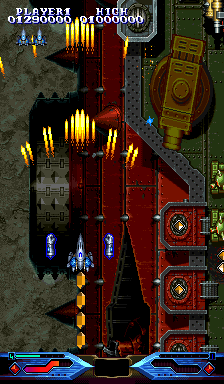 As for sound, the game has the standard set of gunshots and explosions. The music fits well, if you can find time to listen to it. 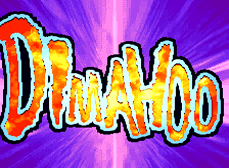 Some of the tracks, specifically boss music, are remixes of tunes from the original “Mahou Daisakussen,” which is actually pretty rockin’ at some points. Also, the announcer voice from “Batrider” has been replaced by a more ominous voice that actually knows when to shut up. Seriously, that announcer guy in “Batrider” really got on my nerves. This guy, on the other hand, only tells you the important things, like “magic: level up” and “here he comes, the strong one.” Ok, now that I think about it, they both talk about the same amount, but the “Dimahoo” guy is a lot less annoying in my opinion. 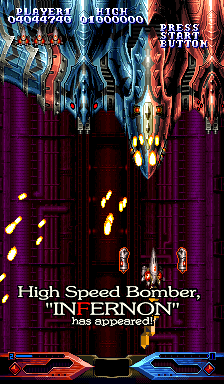 This game is one of my favorite shmups, up there with other greats like Progear and Cybattler. I know for a fact it works on MacMAME, so I assume it works on other MAME emulators. This one is definitely worth a round or two. Some little points may be annoying at times (like sending fire and ice enemies together, you cheap bastards), but that in no way detracts from a great gaming experience. >> Yeah, fire axes are pretty. But I should point out that level 1 has the busiest background in the whole game. Hey, goblins, leave those cows alone! << 8 characters with all the necessary stats to make informed decisions. Actually, the secret characters have some pretty useless stats like Danger, Cute, and Criminal. They’re more of a trial-and-error sort of thing. 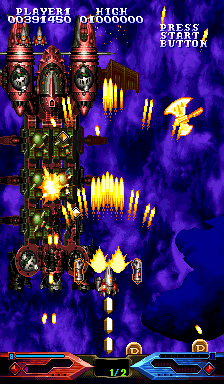 >> I take perverse pleasure in destroying warships. 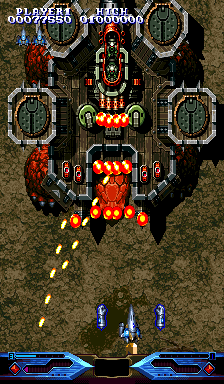 << I'm pretty sure this fortified turtle was a sub-boss in the original. He's bigger and meaner now! 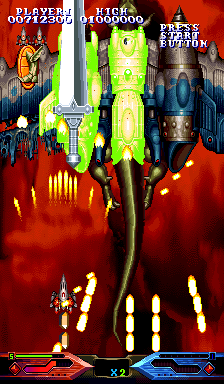 >> A mechanized dragon boss feels the wrath of Gain's charged shot, and apperently dropped boots because of it. 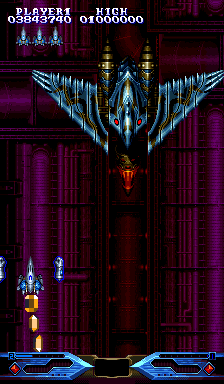 << He's hard to see through the lasers, but there's a mid-level boss here. Don't worry, he'll be back later. >> You begin to notice that the gobligans have a drill motif going on. I guess it's because they're invading from underground. << What's more fun than killing warships? Having a battleship take up the entire stage! >> And now I have to fight the Cypider. Anyone have some bug cypray. By the way, don't try to take this guy apart piece by piece. It only makes him angry. 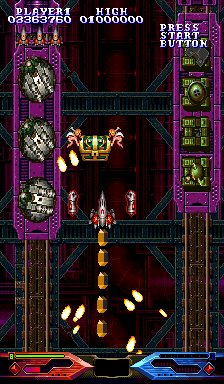 >> This weapons factory has a lot of enemies lying immobile and only partially completed. Only a coward shoots an enemy while it's down, and that's why honorable men die younger. 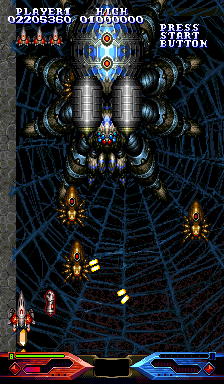 << I can't think of anything as I bemoan that awful "bug cypray" pun. I'll just say that trains are fun. >> And he brought a friend with him! << Yay! Fire laser guy from level 2 is back! 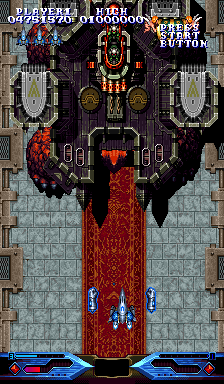 >> Fans of the original will recognize this colosseum, and you get to fight 2 of the bosses again! << And then they merged and started hurting me! This guy will require frequent changes in magic. >> And ninjas! Yet another throwback to the original. << You thought he was mean before, now he has shoulder mounted cannons! 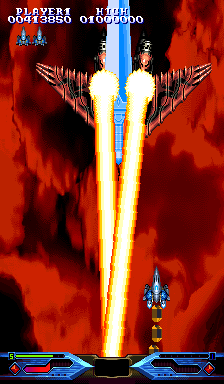 >> Gigafacer returns, as a flying fortress. And he still has the hands from the original, only now they fly at you. Now that I think about it, I hate him. << Okay, the ninja didn't get a robot in the original. I'd call that unfair, but I'm in magical flying armor, so I'm not in much of a position to complain. I would have shots of the ending, but the ending is dull and pointless. You’d think that having 8 characters would be an incentive to create some character driven endings, but not Capcom. I mean, Progear had a total of 11 different ending screens depending on who you used (and if you beat the 2nd loop), Dimahoo just has some babble about “the war ened and everyone lived happily ever after.” Yeah, great, now who were these people?